My 7 is my girlfriend. I have a sort of related story. This took place before I got my 7. I was driving my mom's Saturn 4 door, on the 401 between Toronto and London and there were two cars sitting side by side in the left lanes, so I floored it to get the auto trans to kick down and zipped around them on the right. Well a car that was sitting behind them followed me and gunned it, so "oh someone wants to race" flashed through my mind so I took it up a little faster and as he pulled alongside me I noticed on the fender it said OPP. Ontario Provincial Police. ****!!! So I pulled into the upcoming service station and he kept going. And I just got a warrant paid off so I can keep my license. haha so many stories. i have about 10 friends that are cops but they wont race me. 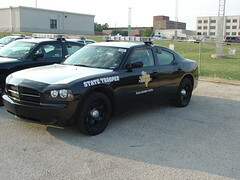 the alabama state troopers just got the chargers and i must say they haul ***. i got to drive one of the crown vics in a parking lot and i was impressed with how fast they are but i heard the chargers blow crown vics out of the water. The Crown Vics don't actually have any performance related upgrades, if anything the Interceptor models are slower than the civilian versions because they have so much additional equipment added that's not performance related. The only performance upgrade under the hood really is the big alternator they use. Quick Reply: Racing a cop!